Recent figures released from the U.S. Census Bureau indicate Utah is among the fastest growing states in the country. Since April 1, 2010, the Beehive state has grown by 397,214 people, ranking 2nd nationally in population change. Over that span of time, Utah’s neighboring states also saw significant increases with Colorado ranked 5th (666,248), Nevada 7th (333,713), Arizona 8th (779,358) and Idaho 10th (186,551). Wyoming, on the other hand, saw modest growth with a just under 14,000 population growth over that span. 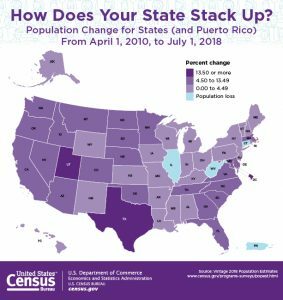 Looking at Census data over just the past year, Utah has seen a nearly 58,000 population growth from July 1, 2017 to July 1, 2018, ranking 3rd nationally. Neighbors Nevada (1st with +61,987), Idaho (2nd with +35,304), Arizona (4th with +122,770), and Colorado (7th with +79,662) also ranked in the top 10 in year over year population growth. Wyoming actually saw a decline of 1,197 residents. Other states experiencing declining populations over the last year include New York (-48,510), Illinois (-45,116), West Virginia (-11,216) and Louisiana (-10,840), among others. Much of Utah’s growth occurred naturally. Births outpaced deaths by a nearly 3-to-1 ratio, making Utah the only state in the country with a double digit percentage increase at 10.5%. Utah also experienced approximately 25,000 new residents through migration: 8,967 international, 16,052 domestic. Idaho saw one of the highest percentages in the country of domestic migration with a 13.9% growth. Utah’s 2018 population is currently estimated at 3,161,105. Idaho’s population is estimated at 1,754,208 and Wyoming’s is 577,737.